January 1, 2019 was heralded as Public Domain Day in the United States, with tens of thousands of published works now available for anyone to use without permission or fee. Under American law, published works, including books, music and films, are protected by copyright for 95 years if they were made between 1923 and 1977. Those works published in the year 1923 have now had their copyright ended, leaving them in the public domain. While much attention has been paid to famous novels and films that are now available, there is also some things that will interest medievalists. Here is our list of 13 books on the Middle Ages that are now in the public domain and are now available to be read or downloaded through sites like the HathiTrust Digital Library and the Internet Archive. 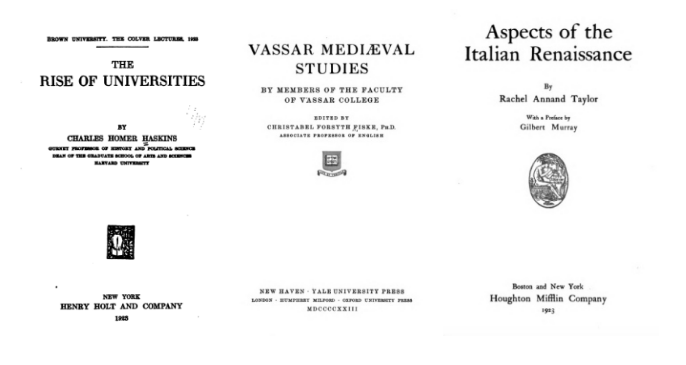 The HathiTrust Digital Library has created a list of over 53,000 items that were published in 1923, and we encourage users to search there for more works that might be available. Please note that other parts of the world have different standards of copyright protection.